The knowledge of the structure of an artefact, as well as that of its constituent materials and of the hosting environment surely ensures safe guideline for its restoration. Unfortunately, in most cases, a scientific investigation preliminary to restoration is not accomplished due to its high costs and, as a fact, diagnostics is performed only for very precious artworks. This paper aims to provide a multidisciplinary diagnostic procedure that, although not exhaustive, is rigorous and relatively low cost. It was employed in view of the restoration works on a country church located in Sardinia. A careful inspection of all the architectural elements was carried out in order to highlight structural damages as well as sources of them. One stone and one plaster samples were analysed. The salt content was determined, in two different areas of the church, using three different sampling procedures while only the normed method was used for the determination along the stratigraphy of the sampled plaster. Microclimate monitoring was also carried out. Water infiltration through the roof was observed. Natural stones and artificial building materials used in the basic architecture resulted to have local source. Both the preliminary “by eye” inspection and the optical microscopy revealed several finishing layers in the investigated plaster samples. The salt content, with some exception, resulted rather low. Microclimate parameters show significant variations only in few areas of the building. Damage observed inside the oldest part of the Church seems to be mainly related to water infiltrations through the roof and the lack of an effective drainage of the rainwater due to a previous bad restoration. Masonry from one of the newest rooms, showing a strong biodeterioration, as well as some areas inside the nave, revealed a significantly high sulphate content. Building materials (stone and aggregates of mortars) are of local provenance. Degradation of materials, although accelerated by human factors [1, 2], is unavoidable. Thus, the good practice in conservation, primarily requires an appropriate maintenance plan and, when possible, a placement and fruition suitable to minimize the degrading effects of the environment. This practice clearly requires the knowledge of the materials constituting the artefact and of the physical-chemical parameters characterizing the environment hosting it [3–8]. Italy possesses a huge cultural-historical-artistic heritage; so, unfortunately, due to its costs such practice is not pursued in many cases and, as a consequence, big restoration works become unavoidable when the degrade extent approaches the artefact’s destruction. Also in this phase, excluding very precious artefacts, economic factors let to omit a preliminary diagnostic phase. In our opinion, the minimum requirements for an effective diagnostic should include a monitoring of the main microclimatic parameters, the knowledge of constituting materials and their eventual forms of degradation, and, for stone buildings (our case), the soluble salt content. Such diagnostic procedure is not so expensive if compared with its beneficial effects in conservation also considering that poor maintenance or bad restoration may cause damage sometimes irreversible and even the loss of the artefact or, at least, a much higher cost for a new restoration. As a fact, microclimatic conditions and salt content, obviously caused by water rise and/or infiltration are recognized as the main degrading agents [3, 7, 9–13]. Measurement and conditioning of the microclimate are ruled by Italian (UNI) [14–18] and European (EN) norms [19–21] whereas, for salt content, only the measurement procedure is provided . In our opinion, norms concerning microclimate and salt content, should be revised because incomplete and/or too old and not in line with the technological progress. However, such debate is beyond the scope of the present paper. Establishing optimal microclimatic conditions for stone buildings must be considered a simple academic exercise as it cannot be generalized to any environment. On the contrary, evaluation case-by-case, of the microclimate variability is definitely beneficial as its extent and frequency are really responsible for degradation. This statement is irrefutable as proven by the survival of very ancient artefacts in climatically extreme environments such as burial or diving. Certainly, an analytically significant monitoring of a building produces a large amount of data that it becomes difficult to process. Multivariate analysis surely provides a simple overview of data and, consequently, allows us to identify correlations that in turn will help to reduce the monitoring points [23, 24]. The main problems of the UNI 11087:2003 , concerning the salt content analysis, relies on the invasive analytical procedure and the lack of a sampling guideline. Alternative procedures were proposed by various research groups [25–29]. Here we present a multidisciplinary approach to the diagnostic applied in occasion of the restoration of the San Maurizio country Church located in Ittiri (Sardinia, Italy). Ultrapure carbonate and hydrogencarbonate sodium salts, sulphuric acid and referenced standard solutions of anions (chloride, nitrate, sulphate at 1000 ppm, phosphate, fluoride, bromide at 1000 ppm) from MERCK KgaA were used to carry out the IC analyses. Olympus U-FMT (Japan) transmitted polarised light microscope and Leica MZ6 stereoscopic microscope (Germany) were used for the petrographic characterization of the stone and the plaster samples. Mineralogic composition of the stone and the plaster samples was also obtained using a Seifert MZIV automatic powder diffractometer. Structure, morphology and chemical elemental composition of the plaster were investigated using a LEO1450VP Scanning Electron Microscope (SEM) equipped with INCA300 X-ray Dispersive Energy detector (EDS). The salt content determinations were done using a Ionic chromatograph Compact IC Metrohm equipped with a 250 mm Dionex column AS22 and a 50 mm Dionex precolumn AG22. Microclimate monitoring was performed using nineteen Hobo data-loggers from Onset Computer Corporation (see Additional file 1: Table S1) and a certified Ebi 20 data-logger from Ebro, (see Additional file 1: Table S1). The country church of San Maurizio lies on a hill few kilometres NE of the village of Ittiri (SS), in the historical region of Coros in Logudoro. The church in its original form was built close to a medieval village . In 1571, after the village was abandoned, the church and all its properties were transferred to the Cathedral of Sassari [31, 32]. In 1688, the church was designated as rural church belonging to the City of Ossi. The two rooms located on the north side of the nave date 17th century, while the present sacristy on the south side of the church, was built in the first decade of 20th century, when the church fell under the control of the parish of Ittiri. The small bathroom, on the north side of the nave, was built around 1970. The church was built using brick, stone and earth according to the types and methods of construction typical of medieval buildings, as observed in Sardinia and in other Italian regions. It consists of a single nave with a barrel vault of squared limestone blocks. The nave consists of four bays slightly decreasing in width toward the altar that gives a perspective effect of greater depth. Presently, the original perception of depth is interrupted by the occurrence of the 19th-century canopy now hosting the statue of the saint. The Church, albeit with homogeneous stylistic features, has small variations: the pilasters are built with stones of alternating colours in the presbytery and of uniform colour in the other three bays. The cornice decoration gets simpler in the first three bays. All these changes support that the construction of the church lasted for several years. The state of degradation was investigated through the visual inspection of the roof, the bottom of the tiled roof covering, parts of masonry and plaster. This allowed to get a detailed picture of the conservation state of the building, which was pretty evident both outside and inside. (Additional file 1: Figure S1). The investigation involved all the architectural elements that showed the bigger degradation signs. The architectural elements were evaluated both as a whole and through single details. The examined roofings are: the one of the nave with an interior barrel vaulted ceiling, the ones of the northward rooms with an interior wooden frameworked ceiling, the one of the sacristy leaning against the southern wall of the nave. The heterogeneity of the constituting materials was also investigated, in particular in order to identify materials used in previous restorations that are not compatible with the original ones. The sample of the building stone was collected from the Church’s façade (see blue square on the map in Figure 1). The plaster was sampled from the West wall of the room located at North-West (see green square on the map in Figure 1) since it showed a strong biodeterioration i.e. a dense network of roots (Additional file 1: Figure S2 (c)). Plan of the San Maurizio church showing the positions of the monitoring data- loggers and of the other sampling points. Thin-sections were investigated by means of transmitted polarized light microscopy (PLM), under plain and crossed polars, through the use of magnifications 40×, 100×, 200×, 400×. Polished cross-sections were observed by a stereoscopic microscope through the use of magnification from 6.3× up to 40×. Both thin-sections and polished cross-sections were prepared by vacuum impregnation with low viscosity epoxy resin. The SEM/EDS analyses on the plaster samples were performed on a polished thin-section. Each layer of the plaster was separated by scalpel with the aid of hand lens. Each of the obtained samples was finely grounded in an agate mortar; a thin layer of the obtained powders was stratified on a satined quartz disk and analysed by XRD. Efflorescences and moisture stains were observed on the walls inside the church (Additional file 1: Figure S1c) demonstrating the occurrence of water-soluble salt accumulation. Since the environment was too large for a statistical sampling, a rational sampling was preferred to identify the areas of major interest and, on these, statistical sampling was carried out. During a maintenance work within the niche where the Hobo 10, 12 and 13 data-loggers were located, a painting came to light that restorers defined “frescoe” but really after our investigation it was found to be a “mural painting in tempera”. Anyway, the niche is certainly an area of historical and artistic interest; therefore, it was decided to assess the risk of degradation caused by soluble salt contamination. At this aim, we choose on a vertical profile three sampling points at 0.7, 1.7 and 2.7 m of height, on the left side of the niche (see red squares in Figure 1). A similar vertical profile was chosen on the left side of the pulpit stairs (see red squares in Figure 1) just to have a comparison with the opposite side of the nave. At each height, we sampled salts by three different methods: in situ extraction using Japanese paper (method a); in situ extraction using cellulose pulp (method b); powder sampling according to UNI 11087/2003 (method c) . The relative positions of the sampling points are shown in Additional file 1: Figure S3. Method a: 50×50 mm pieces of Japanese paper were cut, weighed and placed in plastic dishes labelled with a number and the paper weight. In-situ, they were fully imbibed (about 100 μL) in deionised water (0.1 μS) and placed on the wall; after half an hour they were removed and put back in the plastic dishes. In laboratory, each sample was placed in a 100 ml flask that was brought to volume with deionised water (0.1 μS). Solutions were stirred for about 2 h and then filtered through a 200 nm acetate filter before the analysis. Metod b: 4.5 g of cellulose pulp were placed inside a 60 mm plastic Petri capsule on the bottom of which 4 small holes were previously done; 28 g of deionised water (0.1 μS) were added in situ and the capsule, fixed by wooden planks and springs, was placed on the wall. The capsule was removed after 24 h. Salt re-extraction from the cellulose pulp was performed, in laboratory, by three successive extractions with deionised water (0.1 μS) using 200 ml in total. After each extraction the cellulose suspension was filtered using a MilliQ apparatus and a 0.45 μm acetate filter, the three solutions were then mixed and analysed. Method c: samples were taken until 5 mm deep inside the wall on an area such as to obtain an amount of about 0.5 g. The samples were finely ground in an agate mortar and brought to constant weight at 60°C. 100 mg were placed in a 100 ml flask that was brought to volume with deionised water (conductivity 0.1 μS). Solutions were stirred for about 2 hours and then filtered trough a 200 nm acetate filter, before analysis. All samples were stored at 4°C until pretreatment as well as the sample solutions until the analysis. Measures of conductivity, pH and by ionic chromatography were performed on all the obtained solutions. The main analytical data for the salt content determination are reported in Additional file 1: Table S2. The monitoring campaign began on March 29, 2012 and ended on April 27, 2012. During this period, with the exception of the days during which the sampling of stone, plasters and soluble salts was carried out (8 and 9 April), the Church was closed to the public. Since the Church is located in a rural area, thus not subjected to pollution caused by road traffic or by industries, the analyses of air pollutants were not planned. The Church is not very frequented, really it is open only during the Feast of St. Maurizio (some days around September 22) and one or two times each month for housekeeping; so, air fluxes were not measured in order to keep low the costs for diagnostic. The only thermohygrometric changes inside the nave therefore occur only from two windows located at a height of about 5 m, about at the centre of the north and east walls (see Additional file 1: Figure S4). Instruments used for the monitoring are in compliance with the present Norms (see Additional file 1: Table S1). We adopted a statistical-rational experimental Design, already applied in other buildings (as an example see refs 21–22); it consists in horizontal and vertical profiles covering at the best the building volume and some areas of particular interest. The positions of all used data-loggers are shown in Figure 1 as black diamonds and number or capital letters as label (more details, i.e. height, in Additional file 1: Figures S5-S8). Five data-loggers (HoboG, Hobo8, Hobo9, HoboA and Hobo5) were placed on a horizontal profile, starting from the main entrance and ending on the altar, at a height of about 4 m and a distance of about 5 m from each other (Figure 1 and Additional file 1: S5). Four data-loggers (Ebro, Hobo11, HoboL and Hobo7) were placed on a vertical profile in the middle of the nave, starting at 0.25 m from the floor and ending near the roof, at a distance of about 2.5 m from each other (Figure 1 and Additional file 1: Additional file 1: S5). A shorter vertical profile (Hobo13, Hobo10 and Hobo12) was drawn inside a niche containing a mural painting, starting at 0.20 m from the floor with points spaced about 2 m (Figure 1 and Additional file 1: S6). 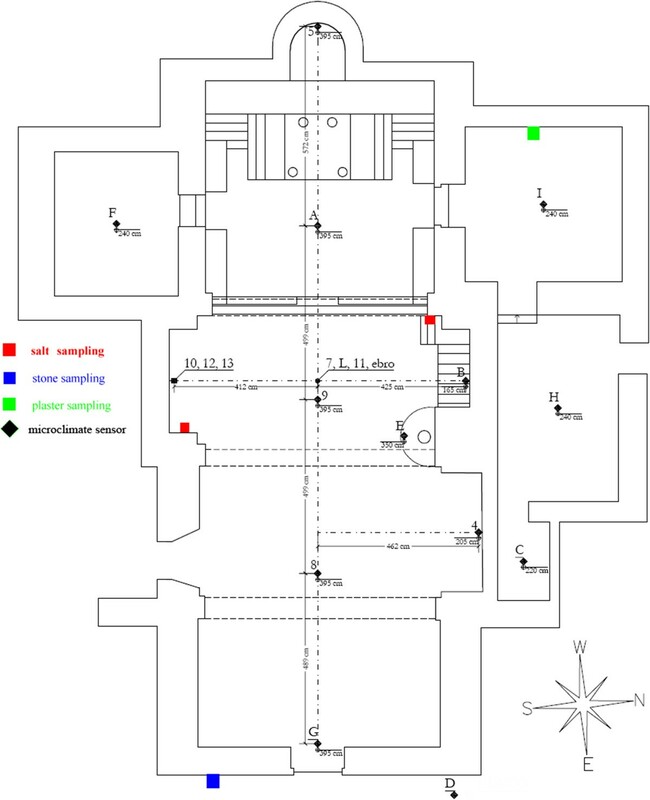 One data-logger was placed inside each of the four rooms around the nave, all at an eight of 0.24 m (Figure 1). The last three data-loggers were placed on the pulpit, on the stairs of the pulpit and inside a niche (Figure 1 and Additional file 1: S7). A data-logger was placed outdoor (see Additional file 1: Figure S8) to monitor the local macroclimate. Among the different possible methods of data treatment, the Box-Whiskers graphs were chosen since they provide the main information on the differences recorded throughout the monitoring period by each data-logger, i.e. median values, 5°, 10°, 25°, 90°, 95° percentiles and spreads. Moreover, in order to highlight the daily maximum variation two graphs showing the average Temperature and Relative Humidity measured at 6-hour intervals, along the vertical profile are also reported. 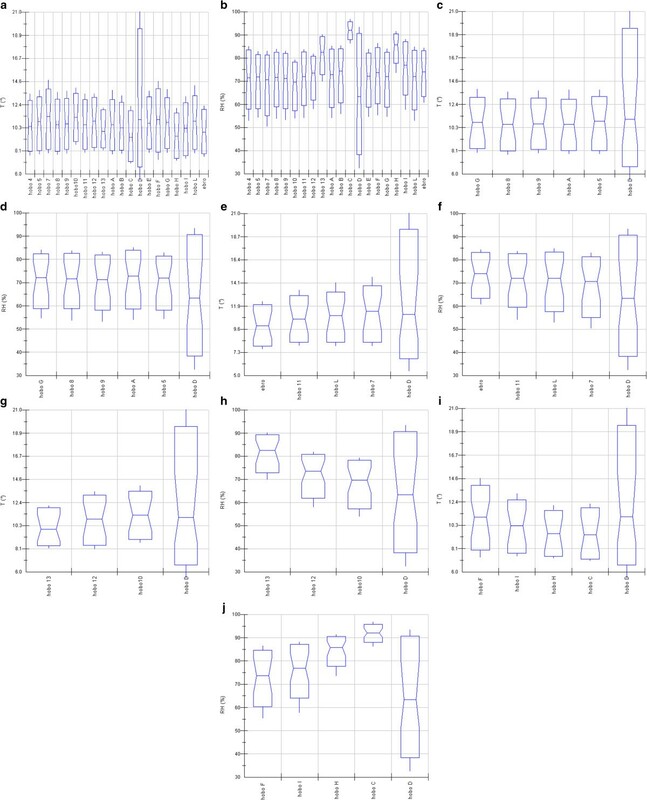 Original data are shown, as run-plots, in Additional file 1: Figure S9. Furthermore, Additional file 1: Figure S10 compares standard deviation (SD) of T and RH data measured by all indoor sensors, during the whole monitoring period, with the corresponding parameters measured by the outdoor sensor, while, Additional file 1: Figure S11 compares the percentage Standard Deviation calculated for T and RH. Such graphs, not only evidence the insulation degree of the building but also the extent and frequency of the variations that, as said in the background, are mainly responsible for degradation. The roofing of the main pitch covering the nave: it has several broken tiles that bring on seepages of water. The tiled roof covering rests directly on the vault extrados with a thin layer of earth in between. The tiles are positioned on some fragments of brick that make the profile regular and formed a hollow space together with the vaulted structure. The tiled roof covering, part of the northward jutting rooms roofing, rests on a wooden structure and proceeds in a continuous way over the masonry barrel vault of the nave. The heterogeneous structure is rather unusual on a structural level. Nevertheless, it comes out uniform thanks to the tiled roof covering that proceeds uninterruptedly along the gently curved path of the pitch and of the barrel vault. The tiled roof covering of the sacristy room consists of plain roofing tiles. The single pitched roof pours water out along the fall line which is parallel to the longitudinal axis of the nave. This pitch interferes with the church projection that coincides internally with the niche wall where a painting was located. However, the solution of the insertion between the sacristy and the church caused seepages of water in the point of contact between the two spaces. This happened because the church projection formed a “plug” that prevents the water from draining regularly. As time goes by, this problem resulted in internal seepages of water causing an advanced degradation of the plaster underneath the painting. Building work: the external brickwork shows an advanced degradation especially in the northern and western façades. In these façades, the plasters are so friable that an integral preservation is not possible. Cement patches evidenced a previous restoration work not compatible with the type of building. The deterioration was due to the seepages of water coming from the roof and to the humidity coming from the external surface. During the excavation work around the building, old drains emerged. In the beginning, these drains had the function of carrying the rainwater and the groundwater to the side of the church. 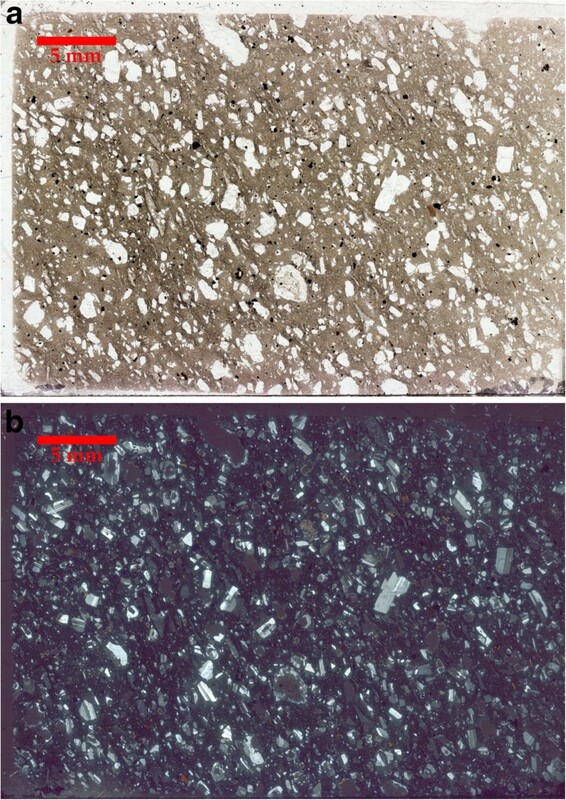 The natural stone sampled on the Church facade (see blue square in Figure 1) is a dacitic to rhyolitic welded ignimbrite, pink to violet in colour in hand specimen with white grains standing up from the matrix. 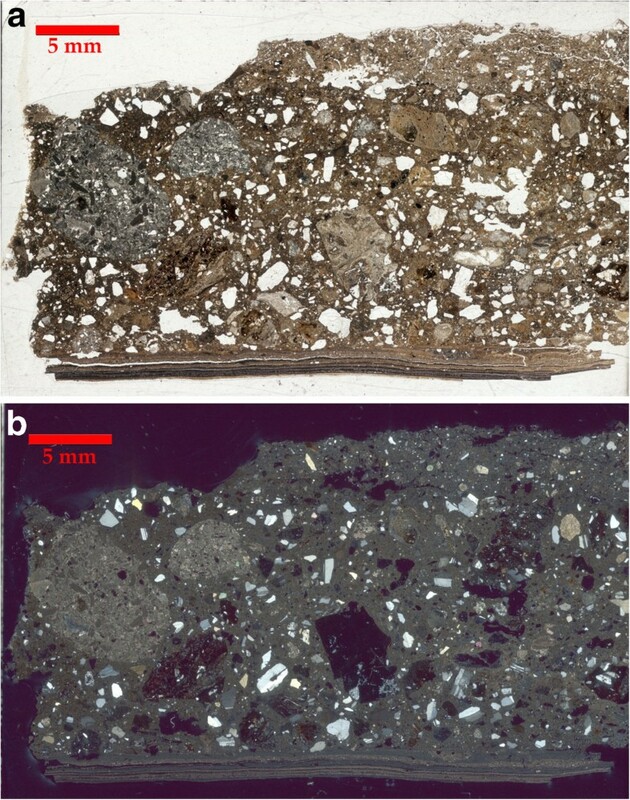 The petrographic analyses (Figure 2 (a-b)) shows a porphyritic microstructure made up of fenocrystals and fenoclasts (modal volume of fenocrysts is about 35%) of dominant andesine plagioclase and subordinate biotite, pyroxene (wholly pseudomorphosed by chlorite), magnetite, lithic fragments of igneous rocks. The groundmass is vitroclastic, glassy to cryptocrystalline, showing a microtextural anisotropy defined by the parallel alignment of flames (flattened pumice and glass shards) and/or vesicles. Zircon and apatite are the main accessory phase. The petrographic features and the mineralogical composition closely match those of the welded ignimbrite deposits of the Oligo-miocene calcalkaline volcanism outcropping in the local area . 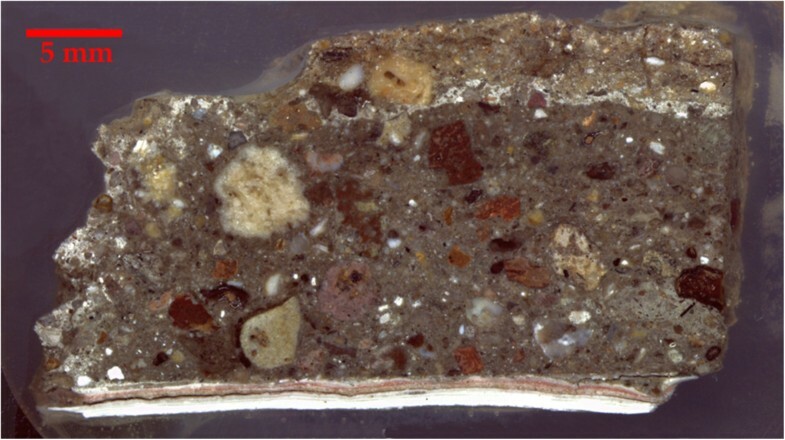 Thin- section photomicrographs of the building stone sampled on the facade of the San Maurizio church. a) view under plain-polarized light; b) view under cross polarized light. A plaster sample was collected from the western wall of the NW room (see green square in Figure 1). Both the preliminary “by eye” inspection (Additional file 1: Figure S2) and the optical microscopy observation (Figures 3 and 4 (a-b)) revealed several layers that were analyzed one by one using Xray diffraction (XRD), for investigating the mineralogical composition, and Ion Chromatography (IC) for determining the salt content. Reflected- light photomicrograph of the polished cross-section through the plaster sample. Thin- section photomicrographs of the plaster sample. a) view under plain-polarized light; b) view under cross-polarized light. Optical Microscope (OM) observations on the thin-section and the polished cross-section show that the plaster sample is made up of two main parts: the inner plaster base (19 mm thick in the cross-section) and the finishing layers (maximum thickness 2 mm in the cross-section (Figure 3 and Additional file 1: Figure S12). The plaster base consists of 40-45% in volume of aggregate with a grain size in the field of average-coarse sand (0.1-10 mm), moderate to scarce sorting, variable roundness (ranging from angular to sub-rounded) and average to low sphericity (Figure 4 (a-b)). The aggregate is homogeneously distributed and no preferred orientation of the grain was discerned. The aggregate is composed of lithic fragments and monocrystalline grains. The prevalent lithologies are dacite to rhyolite igneous rocks showing porphyric textures and groundmass varying from microcrystalline to holoyaline, pyroclastic volcanic rocks with eutaxitic textures and holoyaline volcanic scoria; carbonate rocks (bioclastic calcarenites), quartzites. Monocrystalline grains consist mostly of oligoclase andesite plagioclase and subordinately of quartz, calcite, biotite, magnetite, iron hydroxides and microcline. Fossil fragments of echinides and bivalves were also found. The mineralogic-petrographic composition of the aggregate supports a provenance of the raw materials from the main volcanic and sedimentary lithologies outcropping in the surroundings of the San Maurizio church . The binder is a lime-based (calcitic), nearly homogeneous, micritic sometime microsparitic matrix, although some sparse uncarbonated rounded lumps of lime were also observed. The volume occupying by the lime binder is about 50 vol. %, the porosity is less than 20% on the total volume of the sample and is due to voids occurring in the binder, in the lithic fragments of the aggregate and sporadically due to cracks at the grain-binder boundary. In its inner part the plaster base reveals a distinct layer, showing a lighter coloured matrix, which seem also distinguished by the finer grain size of the aggregate, a minor content of volcanic lithic fragments and a higher porosity in the binder. Such contrasting features could indicate the occurrence of an older plaster layer, different for, aggregate composition, binder concentration and porosity, which probably suffered carbonate dissolution-reprecipitation of the lime binder matrix. Different finishing layers were observed in the top-coat. The plaster base is directly covered by a thin white limewash, which is overlain by two paint layers, the innermost one, pink in colour, with pigment particles (ochre and iron oxides/hydroxides) mixed with carbonate binder, and the outermost showing a lighter yellowish coloration probably due to a lower concentration of pigment particles. At the top of the paint strata a white layer, about 1 mm thick, is observed (Figures 3 and 4 and Additional file 1: Figure S12). It is consists of several continuous finishing coats of the same lime-based paint. A definite detachment separates the top white paint layer from the innermost pink and yellowish layers. 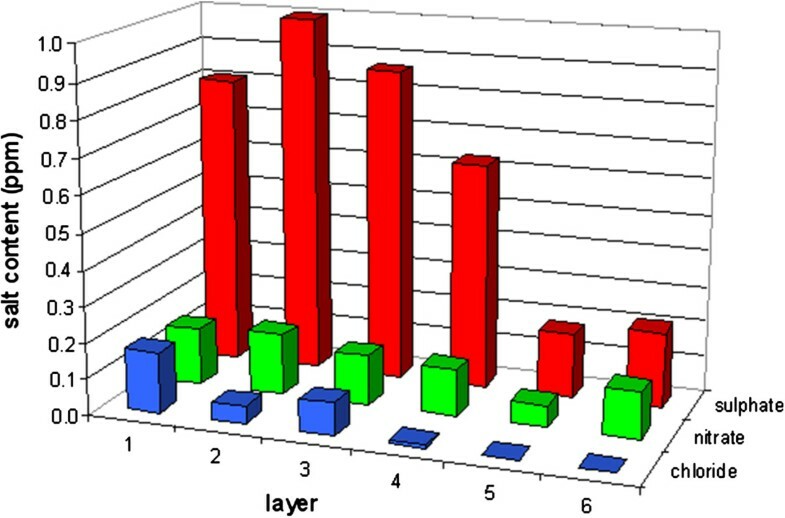 Powder X-ray diffraction analyses (XRD) revealed that the finishing layers (layer 1, 2 and 3 in Table 1 and Additional file 1: Figure S13) are made by lime-based materials. The presence of zeolite and pyroxene in the XRD patterns may be related to small amount of aggregate in the finishing layers. The thin preparatory layer (layer 4 in Table 1 and Additional file 1: Figure S14) that directly overlays the plaster base also consists of lime. The XRD patterns of the plaster base (layers 5 and 6 in Table 1 and Additional file 1: Figures S15 and S16) indicate the presence of plagioclase, quartz, biotite, piroxene, zeolite, calcite as the main constituents of the aggregate and of calcite as binder phase, confirming the petrographic observations. In the innermost layer, clay minerals were also detected by XRD analyses justifying the scarce cohesion and adhesion of the plaster base. +: present; -: absent; (+) present in small amount. Numbering of layer starts from the outermost one. 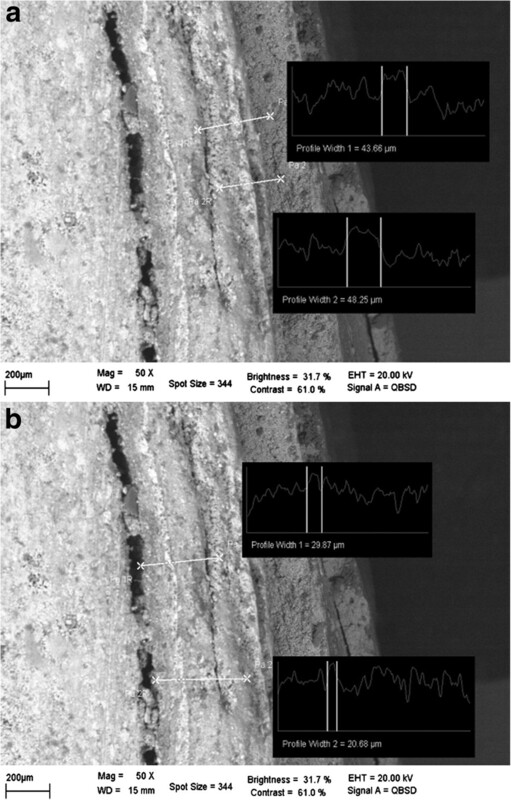 The SEM/EDS analyses (Figure 5a-b) on the outermost white finishing layer well agree with the optical microscopy observations concerning the occurrence of multiple finishing coats composed of calcium carbonate (Layer A). However, in the lower part of the layer (layer B), EDS microanalyses revealed the presence of S, Ba and Zn suggesting that was used lithopone (ZnSBaSO4) as finishing component. Such pigment is not commonly used as finishing layer; however, since no other traces of wall paintings were found on the church walls, during the restoration, it is supposed to be employed for its high covering power. Since lithopone started to be used from the second half of 1800 and the room was built in XVII century (see Church description), we can have a rough dating of a previous restoring intervention. Scanning electron microscopy (SEM) images of the outermost layers of the plaster sample. a) detail of the lime-based finishing layer; b) detail of the lithopone-based finishing layer. 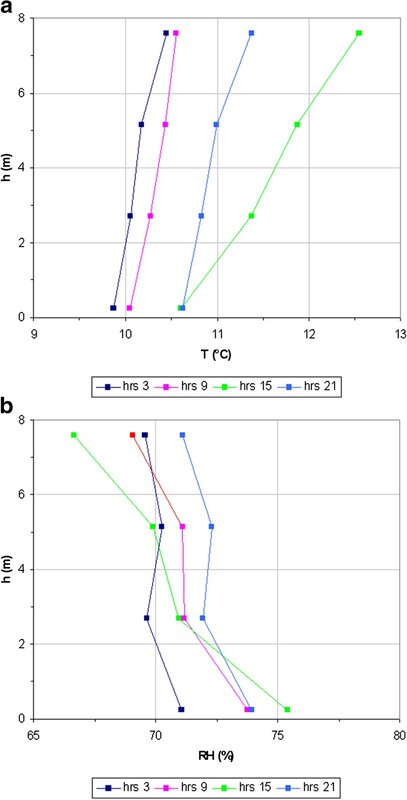 Taking into account guidelines given by some European Institutions involved on conservation of stone materials (see Additional file 1: Table S3), IC analyses (Figure 6) point out a moderate sulphate contamination in the four outermost layers of the plaster with a maximum in the second one. In all the layers, chloride and nitrate concentration are low, sometimes under the Limit Of Detection (LOD), i.e. 0.05 ppm in the analysed solution (see Additional file 1: Table S2). Variation of the soluble salt content through the plaster stratigraphy. Two sampling vertical profiles were chosen inside the nave of the church, on opposite side. One profile (on left side wall facing the main altar, see red squares on the map in Figure 1) was located inside a niche containing a wall painting, being a position of particular interest. Three different sampling methods (see the relative sampling positions in Additional file 1: Figure S3) were adopted: One (invasive), according to Italian norm UNI 11087/2003  requires the sampling of powder from the substrate, while the other two procedures (non invasive) base on the in-situ extraction of water soluble salts using Japanese paper and cellulose pulp. Figure 7 (a-c) shows that data obtained by the three sampling methods are significantly different. Indeed, the UNI method reveals a higher salt content on the right side of the nave; on the other hand, the amount of salts extracted by cellulose pulp is higher for the sampling points located on the left side of the nave whereas the salt content obtained using Japanese paper is similar for the two sides. Variations of the soluble salt content along the two vertical profiles inside the church nave: sampling by: a) extraction using Japanese paper; b) extraction using cellulose pulp; c) coring. 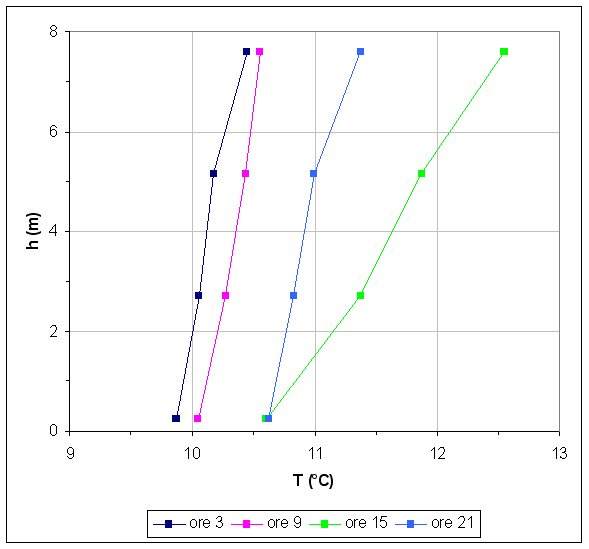 Such data are also in agreement with the conductivity measurements on the solutions obtained by the three methods (Additional file 1: Figure S17). The overall results suggest that, in the three procedures, salts were extracted from different depths within the wall. Actually, the maximum sampling depth is known for the UNI method (5 mm) but there is no information for the other two procedures. Anyway, a much higher efficiency of the extraction using the cellulose pulp compared with that obtained with Japanese paper is evident and it could be correlated to an extraction from deeper levels. Probably, Japanese paper, due to the low water content and the short time period of contact with the substratum, extracts salts only from a very thin superficial layer; the data obtained by this method evidence the same salts content on both the two sampled surfaces with a maximum in the central part of the profiles. If we consider the exposition of the walls from which the sampling profiles were chosen, data obtained by the UNI11087/2003 procedure could be justified even if not completely explained. The left side wall, being an exterior wall, is subject to direct sunlight which entails wide thermohygrometric variations along the wall thickness, due to the larger variation of outside temperature than to inside (compare Hobo D and Hobo 12 in Figure 8 (a-b)). On the other hand the right-side wall, being an interior wall separating the nave from the room monitored by data-logger H, bears a lower thermohygrometric change between its opposite sides, since the temperature variations inside the two environments are almost similar (compare HoboB with HoboH data-loggers in Figure 8 (a-b)). Such climatic condition leads to a scarce movement of salts inside the right wall and salts preferentially concentrate near the warmer side (inside the nave) where water evaporation is favoured. On the left side wall, salts move toward outside during insulation (maximum external temperature) and in the opposite direction during the night (minimum external temperature) and probably concentrate at a level deeper than the sampled one (5 mm). On such basis, it could be also hypothesized that the cellulose pulp can extract salts at a depth higher than 5 mm. Box- Whiskers graphs for: a) and b) data from all data-loggers (T and RH in the order); c) and d) data from data-loggers located on the E-W horizontal profile along the Church nave (T and RH in the order); e) and f) data from data-loggers along the vertical profile located in the middle of the Church nave (T and RH in the order); g) and h) data from data-loggers along the vertical profile located in the niche hosting the wall painting (T and RH in the order); i) and j) data from data-loggers placed in the rooms around the Church (T and RH in the order). However, data obtained by the UNI method, that surely must be considered the more accurate, indicate a worrying sulphate concentration in the colder right wall, (i.e. higher than 3% w/w for the lower sampling point (see Additional file 1: Table S3). During the monitoring campaign the church was closed to the public; so, all the observed variations are only related to the macroclimate changes and can be useful to evaluate the insulation level of the building and the spontaneous thermohygrometric conditions. Additional file 1: Figure S9 provides the trends of Temperature (T) and Relative Humidity (RH) registered in all the measuring points (indoor and outdoor) throughout the monitoring period. It can be noticed a general good insulation inside the nave; actually, as better evidenced in the Box-Whisker plots (Figure 8 (a-b)), the T and RH fluctuations for all the indoor sensors result half, or lower than half, of the external ones. Such features are also evident in Additional file 1: Figure S10, where the standard deviation (SD) of T and RH data measured by all indoor sensors, at each ten minutes interval, throughout the whole monitoring period, are compared with the corresponding run-plots of the outdoor parameters (HoboD). Additional file 1: Figure S11, where the percentage standard deviation of T and RH are compared, shows that RH fluctuations are larger than those of T.
The highest RH values and the lowest RH spread were recorded inside the room monitored by HoboC (Figure 8b), in agreement with its north-facing position. Slightly lower RH values were registered in the room monitored by HoboH (also north-facing), and in the point monitored by Hobo13 (in south-facing position but at the minimum sampled quote, i.e. about 0.2 m). No enough significant variations result for the horizontal profile along the nave (Figure 8c and d), while small but significant changes are evidenced along the vertical profile in the middle of the church (about 1°C of T and 3% of RH, Figure 8 (e-f)). The largest thermohygrometric variability is observed along the vertical profile inside the niche containing the wall painting (more than 1°C of T and about 14% of RH, Figure 8 (g-h)) and among the four rooms around the church nave (about 2°C of T and about 19% of RH, Figure 8 (i-l)). The decreasing RH trend from bottom to top observed inside the niche suggests that water enters by rising damp (being the exterior wall directly in contact with the ground) rather than by infiltration through the roof. As regards the four rooms around the nave, data are congruent with their orientation and sun exposure. The minimum temperature inside the church was measured approximately at about 3 am. Average temperature and relative humidity were then calculated from data recorded by each data-logger, daily, at 3 am and at 6-hour intervals, throughout the monitoring period. 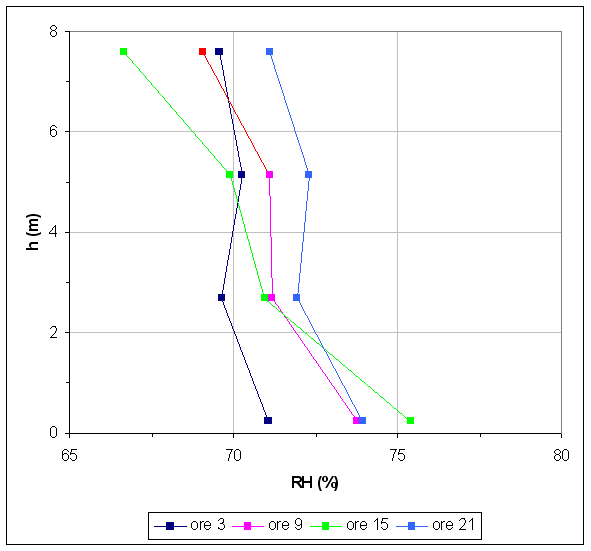 As an example, Figure 9 (a-b) shows such average values obtained from the data-loggers positioned at different heights along the vertical profile in the middle of the nave. It is obvious that the real maximum average T, as well as the maximum and minimum average RH, may not correspond (either as values that as times), to those inferred from Figure 9 (a-b). The T trends along the vertical profile (Figure 9a), at all the established times, are those expected for a not-conditioned environment. The T changes observed during the day at each different height are consistent with a circadian cycle and, as expected, with an increasing extent at increasing height. Actually maximum Temperature variations between the floor and the ceiling in the middle of the Church occurs at 3 pm (15.00); at this time, the maximum temperature is also observed except for the sensors near the floor for which the T value is comparable to those measured at 9 pm. A decreasing RH trend, fully coherent with the T increase, is observed only at 3 pm (Figure 9b); on the contrary, at 5 m of height, the 3-am, 9-am and 9-pm trends show an anomaly (RH increase instead of a decrease) that could be reasonably due to the outdoor humidity entering through two windows located at about the same quote and left always opened during all the monitoring period (Additional file 1: Figure S4 (a-b)). Indeed, the anomalous RH increase is higher during the night. Contrarily to those observed for Temperature, the RH trends along the profile cross each other, thus the RH daily trends are different at the various quotes and never follow circadian cycle. This is probably due to the presence of two humidity sources: the capillary rise of water (almost constant) and the humidity coming from outside, greatly varying during the day at the higher quotes. However, T and RH fluctuations, either along the profile than during the day, are quite small so confirming a good insulation of the church nave. Trend of Temperature ( T) and Relative Humidity ( RH) averages calculated from data recorded by each sensor, daily, throughout the monitoring period, at the same times as a function of the height along the vertical profile located in the middle of the Church. a) T; b) RH. The Church suffers for a poor and/or bad maintenance that let to structural damage. Certainly the placement in direct contact with the ground and the burying of the original channels for rainwater drainage involve a rising damp and consequently salt accumulation within the walls. Petrographic and XRD analyses have been particularly helpful for the choice of materials to be used for the restoration, i.e. locally sourced stones for the oldest parts of the church and for mortar aggregates. The patina effect was obtained by a suitable mixing of lime and local sand, choice to get the color of the original surfaces. The plaster sample collected from the room monitored by Hobo I, presents serious biodeterioration and high sulphate content in the outermost layers. The finishing layers, at least three, two of which pigmented, are based on lime; plaster base is made up of lime and an aggregate of local raw materials. A worrying sulphate content was revealed also in the lower sampling point of the vertical profile inside the niche. Further analyses after restoration are suggested in order to assess the need for desalination treatment. The microclimate monitoring revealed good insulation with indoor thermohygrometric fluctuations resulting half or less than half of the corresponding outdoor ones. T and RH variations are almost null along the horizontal profiles, limited but significant along the vertical profile in the middle of the nave, whereas the higher variability resulted along the vertical profile inside the niche containing the wall painting and among the rooms located around the nave. During the monitoring period, along the vertical profile, the maximum variation of T and RH occur at 3 pm (2°C and less than 10%, respectively). The maximum RH variation coincides with the maximum tolerance foreseen by the UNI 10829 whereas no indication is available for temperature. The number of sensors for a future continuous monitoring could be greatly reduced although a second campaign covering the four seasons would be needed. The restoration work mainly foresees: a) the maintenance of an hollow space between the ceiling and the roof in order to minimize the vertical thermohygrometric fluctuations; b) the complete overhaul of the roofing through substitutions and/or integrations in the tiled roof covering together with all that is necessary to prevent seepages of rainwater; c) the realization of a drainage to reduce the supply of water which stagnates on the ground close to the wall of the building; d) the removal of not original and degraded plasters from the walls and the subsequent restoration through the application of a natural lime-based mortars with aggregates from local quarries; e) the preservation of the wall heterogeneity and the patina effect. Gavino Cau, Rita Reale, Sara Ronca and Giovanni Visco contributed equally to this work. Thanks to Valeria Cuzzilla, Natalia Macro and Martina Tornese that contributed to the work as some parts constituted the internship job for their bachelor's degree. MPS supervised all the research steps (excluding the structural inspection and the petrographic analysis), processed the data and wrote the article. GC supervised the structural inspection and drew all the maps. RR participated to the sampling campaign and carried out the chromatographic analysis. SR carried out the petrographic analysis and wrote some parts of the paper. GV conceived the sampling design and helped to the data treatment. All authors read and approved the final manuscript.